Gonna need some help from the Man upstairs tomorrow. The Warriors are not confident in the Cats this week with only Gregory T. Bag picking the boys in purple. Let’s hope he’s right. Everyone picked the Cats last week keeping the race neck and neck and neck between Roger, Roche and Paul. Shoutout to Roche for missing the score by just 3 points last week with his 24-14 prediction. How about that! The road team hasn’t won a game in this series since 2000, when Northwestern marched to Madison and won 47-44 (we don’t see that color of turf anymore!). What’s more surprising to me is that the Badgers haven’t won in Evanston since 1999! They’re 0-4 at Ryan Field since 2000! Research is fun. And I guess this series has been more even than I had suspected. Can Northwestern win? Sure! Will they win? Well that’s contingent on their offense performing at a mediocre level, which I don’t think we’ll see tomorrow. They had trouble against Purdue.Wisconsin is a much better football team than Purdue. Game Summary: Wisconsin sets the tone early with an opening drive TD, and the ‘Cats can’t make any ground on offense. The score stays 7-0 until the late third quarter when the Badgers put together another long drive to eat up clock and push the score to 14-0. Jack Mitchell punches in a FG at some point thereafter. Play of the Game: Jump Around is always fun at Camp Randall. They’ll show it on teevee too. Let’s go with that. Warrior to Watch: ZVon will be in attendance in Madison. Look for him in his purple suit looking for ways to stay warm. All those ways involve alcohol. This game is huge for both teams. Wisconsin still has the slightest of chances to pull out the B1G West. 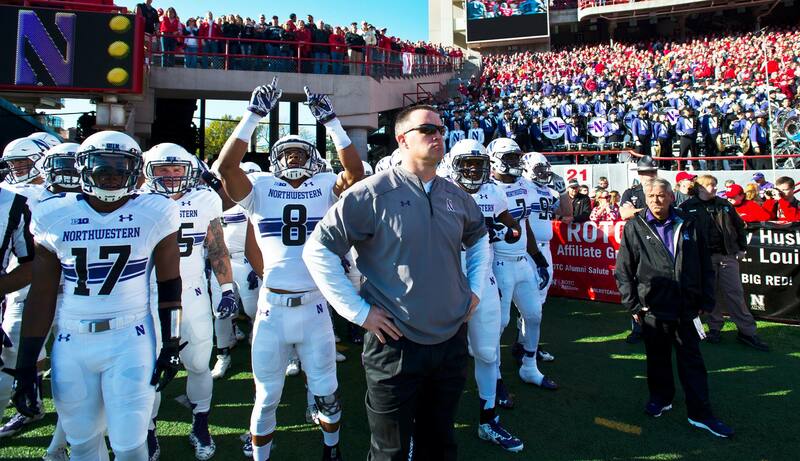 The ‘Cats are fighting for position in the rankings to make a run at a New Year’s Six Bowl. It’s going to snow, and then going to warm up a bit, so we could have some slushy conditions come game-time tomorrow. Wisconsin and NU boast identical 8-2 records – both teams have only lost to elite teams, but the ‘Cats have better wins (namely Stanford). Wisco has a stifling defense, and actually isn’t a typical Badgers squad as they rely more on the pass than the run. I see this as a defensive battle, especially given the crap conditions. Game Summary: As I mentioned, Wisconsin does not rely as heavily on the run in years past, and their best RB Corey Clement is looking doubtful for this game. So, they’re going to have to look to Joel Stave to move the ball through the air. Snow will be falling in Madison over the next 24 hours, but unfortunately it looks like it’s going to subside before game time. So, the field might be in bad shape, but the air should be clear enough for Stave to sling it. Last year the ‘Cats secondary owned Stave (and Tanner McEvoy, who started that game) with four total picks, three by Godwin Igwebuike. I think the ‘Cats are going to need at least two turnovers to stay in this one. Having watched Wisconsin a lot over the past few years, I am pretty familiar with Stave and the way their offense operates. I can tell you right now they really only have one WR threat, Alex Erickson. He has over 800 receiving yards on the year – the next closest player on Wisconsin has less than 400. If Fitz/Hankwitz are smart, they’ll put Erickson on Matt Harris Island, and take him out of the game entirely. If they are smart enough to have Harris blanket Erickson all day (a big if), they can shut down this Wisconsin passing attack, and turn them into a one-dimensional offense. So there’s a nice road map for our D to shut down their O, the only issue is that we need to score points to win. I have a hard time seeing how the ‘Cats will move the ball in this game, especially if Bigsby Thorson plays like he did against Purdue. And, this will only be Thorson’s fourth ever road game. In watching the Nebraska game on TV, the crowd honestly didn’t sound that intimidating. Duke’s crowd was a joke. Unless the cold/snow scares away a lot of Badger fans, I see Camp Randall jumping around on Saturday and making it really tough on Thorson. One thing Thorson has going for him is third down conversions – I’m too lazy to look up the numbers but I’d bet he’s better on third down then he is on first or second. That’s not as easy to do, however, when it’s third and long and the ground is literally shaking. Alright, that’s a lot of setup for a quick prediction. I think the ‘Cats force a few turnovers, get good field position out of it, and convert in the red zone for once. They’ll do just enough in a hostile environment to pull out a W, and get Chick Fil A after the game. Kudos to the Daily Northwestern for this fantastic and important piece of journalism…hoping for a repeat on Saturday. Play of the Game: Cakes Walker catches a tipped pass late for his first INT on the year, to seal the game. Player to Watch: Matt Harris. As mentioned above, the ‘Cats need Harris to blanket Alex Erickson all day. That will give us a chance. Warrior to Watch: Roger Rankin has a wedding on Saturday – will he be able to catch the end of the ‘Cats game? Will he be following on his phone in church? Other Games to Watch: Three this weekend, one each day. First off: Bulls-Warriors tonight. I think the Bulls take down Steph Curry and crew (who looked unbelievable last night and are ripe for an emotional letdown), giving Golden State their first loss of the season. Second: UNC @VT tomorrow. Virginia Tech’s coach Frank Beamer has been around for like 100 years, and is finally retiring at the end of this year. VT has been to 21 straight bowl games. They currently need one more win for bowl eligibility. Tomorrow is Coach Beamer’s last ever home game. Down goes UNC. Third: TREVOR SIEMIAN comes back to town on Sunday, now as an official NFL back-up quarterback! He is now one Brock Osweiler injury away from taking the field. Never want to hope for a player to get injured, but it’d be pretty darn cool to see TrevDog take the field once again in Chi Town. I hate the Badgers. Great city. Horrible fans. Horrible program. I may be saying that because we’ve gotten destroyed there too many times, but that’s neither here nor there. Game Summary: This is going to be a cold one, although the snow will likely have been cleared by kickoff :-(. Let’s just say I’m glad I’ll be watching this one indoors. The Cats will have spurts of offensive success throughout the game, but unfortunately won’t be able to get into the end zone a single time. Little Jacky Mitchell will shank one and make one in the first half while the Badgers put up 14 points on two sustained drives that heavily rely on the run. Going into halftime the Cats fans know that’s all she wrote. While the defense keeps the Cats within 2 scores into the 4th quarter with a clutch red zone INT, there’s no stopping the Badgers and they roll. Player to Watch: Bigsby. But he’ll drop the ball, figuratively. Snax will see some action. Warrior to Watch: ZVonE!! He’ll be making the trek up north ensuring only 1 game (NEB) was missed by the Warriors. Will the purple suit come out in this weather? +230 on YES. Other Games to Watch: The best record matchup of the week MSU @ OSU in which the Buckeyes will eek out a win. Hammer MSU +13.5. This one is closely followed by two 9-1 teams battling it out. Charleston Southern vs. #2 Alabama. Hammer BAMA -38.5. Well, well, well…. The ‘Cats go up to Madison once again. A place we haven’t won for awhile and the last two matchups we’ve lost 105-29 cumulatively. I don’t know what it is about Wisco but we have a tough time there, they have a tough time here. However, the past 24 matchups have resulted in a 12-12 series tie. I like the ‘Cats to keep this one closer, maybe even win, but it’s going to be a defensive game regardless, I think. Shout out to Starwood for the room this weekend – who knows how or where the rewards system will go. Game Summary: NU offense doesn’t do much in the first half. I think we muster a FG. Wisconsin’s defense is too fast and solid for the ‘Cats to do anything out of the gate. Wisco scores 10 in the first half. Second half and we put together a nice JJ run to get us close, down 13-10 but the Badgers play solid from then out and win. Play of the Game: Justin Jackson with a 15 yard td run in middle of third Q. Player to Watch: Bigsby – will the cold hurt him? Can he be confident? Does Snax play again?! Warrior to Watch: Andy Day – he won’t have to wake up too early for this one. Special Celebrity Warrior nomination for Scott Harold. He’ll be in Madison with me (and my brother) and we’ll be taking in the game as well as some brews. Other Game to Watch: Ohio State vs. Michigan State – it seems like the hoopla isn’t there because of MSU’s loss to Nebraska (of all teams) but I still think this is a great rivalry in the B1G. Game Summary: I have been to two games in Madison, Wisconsin. The Cats have been blown out twice. Luckily for the Cats, I will not be in attendance, but I don’t see this going much better. Play of the Game: Dean Lowry sacks Stave for a 26 yards loss. Player to Watch: Bigsby – show me what ya got kid. Warrior to Watch: Z Von. Will he end up shot gunning beers in sorrow at 5 am again? Other Game to Watch: Ohio State vs. Michigan State because ya. Game Summary: Defensive slugfest. Stave makes plays when he needs to. Thorson doesn’t. Play of the Game: Dean Lowry gets his big paw on an extra point and blocks it. Warrior to Watch: Von… Of course. He will be there.